(Hong Kong, China)- The annual Royal Hong Kong Yacht Club Around the Island Race is one of the biggest inshore events in Hong Kong. 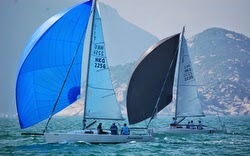 It is a 26.0 nm race around Hong Kong Island involving Class Keelboats, Dinghies, Beach Cats and Cruisers. Winning IRC 2 Class and taking 12th overall in what was decidedly a big-boat race was David Mitchell’s J/145C REDEYE, rounding the 26.0nm course in 3:58:16, for an average of nearly 6 kts. Fourth in IRC 2 was Rick Van Den Berg’s J/111 JUGGERKNOT. Taking 5th place in the IRC 3 Class was Nick Southward’s J/109 WHISKEY JACK. In the eighteen-boat J/80 class, it was a horse race all the way around the island, with several teams running neck-and-neck the entire way. Ultimately, it was Henry Wong’s FOOTLOOSE that won the class by 11 seconds over Rita Yau’s JELIK 7! Then, just over a minute back was Ben Bulmer’s JASMINE in third place, just edging out by a half-boat length (4 seconds worth) Sarah Page’s SEABISCUIT. Fifth place went to Andrew Blank’s JAVELIN and Pascal Martin’s J/105 LEGENDE took 7th place. 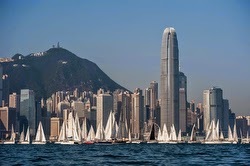 For more RHKYC Around Island Race sailing information Add to Flipboard Magazine. J/24 World Champions Bleeding Edge?? J/Crews Enjoy The Great Pumpkin Race! J/111’s Sailing FUN Down Under!